He has lined up against the best footballers in the world. Talk of Neymar, Coutinho, Frank Ribery ,Robben , Schweinsteiger to mention just but a few. He also has had a close chat with the world best- Lionel Messi. His friends have nicknamed him "Khalidihno" due to his great Brazilian like skills on the pitch. Harambee Stars under 20 striker Khalid Jumaan may not be a household name in Kenya but is definitely going places. The 18-year old striker began his soccer career at a tender age while based in Mombasa. During his playing Period in Kenya He has been played alongside some of the best talents in the country including Paul Thiongo (Empoli-Italy) and Abdio Mohammed(HamKam-Norway) and got technical advice from the Athman juma of Mombasa United Charity Academy. His big break came in 2007 when he beat stiff competition to emerge as one of the top three players in Kenya during the ASPIRE Academy for Sports Excellence talent search. He was scouted by the same man the man responsible for bringing Lionel Messi to Barcelona- Joseph Colomer. 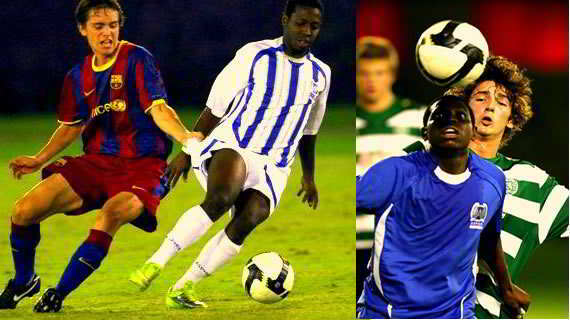 Currently based in Qatar with Aspire Academy, Khaleed enjoys world class training and exposure. He has played against the best clubs in the world including ; Barcelona, Real Madrid, Sporting Lisbon and Bayern Munich. His posh room in Doha, Qatar is well colored with posters of Messi and Ronaldo, a clear testimony on which players he emulates. But he points out that Barcelona's Iniesta is the player he can watch 24-7. 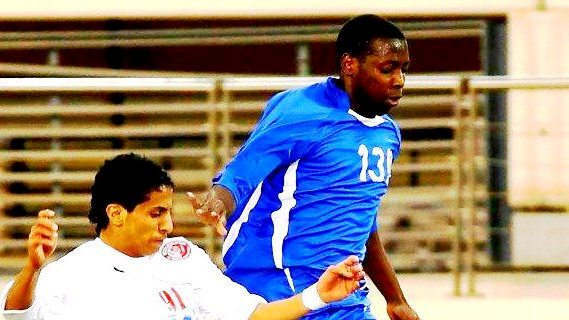 Michezoafrika.com had a one-on-one chat with Khaleed from his base in Qatar and here is his incredible story. MA: Please tell our readers how you ended up in Qatar? Khaleed: It’s a long story but I will try to be brief .I was born in Mombasa and discovered my telent early.I used to play in many tournaments and had the privilege to play alongside some of the best talents including Paul Thiongo(Empoli) and Abdio Mohammed (HamKam-Norway).In 2007 , I heard of Aspire Academy trials in Kenya that were being conducted by Vision 21 Sports. I decided to give a try and luckily I was among the players that made it. Head scout Joseph Colomer settled for me alongside Reuben (Munyao) Muthini, George (Otieno) Ouma as the top three players from Kenya for a chance to live, study, train and develop their skills within the Academy. The three of us went to Qatar and joined other players from all over Africa to make two teams of 15 players each. Over 430,000 players took part worldwide so finishing being among the best in Africa was an achievement in itself. MA: It must have been a huge moment for you .How did you progress from there? Khaleed: I have to admit there was a culture shock. Things were so different from what we were accustomed to. We soon hit the road and started training . For about a month we only used to train but later we started playing in friendly matches. I vividly remember a matches that changed everything. English side Charlton Athletic sent their squad which had the meanest defense .Somehow we managed to score against them and it's from there that even the managers realized we were a serious team. They started bringing in more stronger sides like Real Madrid. MA: Great progress there. What happened to the two other Kenyan players since you are now alone. Khaleed: After six months ,the team had to be trimmed to twenty from the thirty players who formed two teams of 15 each. It was a rigorous process and the coaches took notes on each of the players. I was lucky to be among those players retained but my two other Kenyan brothers were flown back home. It was an emotional moment and I believe their talent will take them far..
Khaleed: Our life at Aspire Academy revolves around three things; training, school and participating in tournaments. We have the best coaches and facilities in the world. The program varies depending on the upcoming tournaments and technical advice. That however does not imply we don't have time on our own. Like now am done with training for the day and I am going to enjoy a movie or a walk. MA: You don't play in a league, how do you manage keep competitive? Khaleed: We are always booked for high profile tournaments. I have played in tournaments Spain against the likes of Neymar and Coutinho.Last year I scored one of the crucial goals during the Vietnam - EximBank Cup.Soon our manager will be placing us in a club where we can play in a competitive league in n Europe that's why we have been patient as negotiations are ongoing. Khaleed: I have had so many great games and scored wonderful goals.Our game against Bayern Munich was a match I will always remember Frank Ribery telling me to play my game and tackle him without fear. I am so happy to see the same players playing in the Champions league final. Also the time Messi paid us a a surprise visit is still intact in my memory. I remember our coach say we have a visitor, a short man came in and it wasnt easy to recognize him. He told us: "I am Messi and am here to share my experience with you". He is a shy guy but we all loved the time together. MA: How does it feel to work with one of the best scouts and coaches in the world? Khaleed: Our manager Joseph Colomer has been giving us great advice. He has seen so many players with potential end their skills by joining top clubs the rotting in the bench. He is keen that we avoid that route. He is a man with great experience so we are also keen to listen.Our current coach was formerly at Espanyol and has imparted alot of skills on to us. MA: You have been paired among the Senegalese , Cameroonians? what do they do right that us Kenyans don't? Khaleed : The western African s are very hard working. In Kenya if everyone says you are good you relax but our brothers from Senegal etc are always working hard. A player may pick an injury today but works hard to recover and come back to the pitch. They approach every game like it is a final and that a mentality we East Africans need to adopt. MA: Do you follow soccer in Kenya and if so what are your comments? Khaleed: The media has been great in furnishing us with the latest news on Kenyan soccer .I am impressed by the level of competitiveness in the KPL league and the exposure players are getting.I always admire Jamal Mohammed's style of play. Abdulatif Omar,Rama Salima and Crispin Olando are great players I can also single out. Internationally I follow Patrick Osiako's progress,Ayub Timbe,Paul Thiong'o, Amos Ekhalie etc. I hope one day we will play in the same national team. MA: You have been called up to the national team. What should we expect? Khaleed: I thank God for the blessings so far. It is a privilege to be at Aspire Academty.With believe in yourself and determination the sky is the only limit. I hope to become one of the best strikers in Africa so watch this space.